A CIA agent, at the time of te cocaine epidemic in the 80's, is trying to fund the Contras, and a whole lot more. It's a TV movie made into a show. A CIA agent, at the time of te cocaine epidemic in the 80's, is trying to fund the Contras, and a whole lot more. It's a TV movie turned into a series. Where can you stream Snowfall? On 2017-07-05 Crime/Drama TV Series Snowfall first aired on FX. 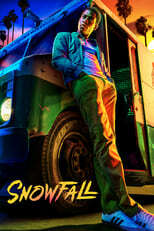 Written and created by Eric Amadio & John Singleton, Snowfall will return and was last broadcasted on 2018-09-20.